Competition can be stressful. Learning how to maximize your chances and minimizing problems is very important. You want your beer to be judged in its prime, unharmed from shipping or poor handling. You may wish to start a 'career' in competition, which is great, but takes planning and can cost a considerable amount of money. Hopefully you will find tips and tricks below to help you find some success. Let's set some assumptions: You have to brew exceptional beer consistently. Your recipes must be refined and strike an impression of a specific style category. You need to have your fermentation and packaging technique completely under control, even if you bottle condition. You must also have a realistic view of what happens during competitions. Truly great beers don't always medal, but they should have consistently high scores. I am not trying to scare you off or discourage you from entering, just setting an expectation for your competition experience. Prepare your attitude for both success and disappointment. A low score should be disappointing, but not crushing! Make sure to take constructive feedback appropriately and simply ignore the occasional crappy remarks. Your beer should be reviewed by skilled judges with sensory training. Take their feedback seriously and refine your process. Competition is not for everyone. Why should I enter a competition? There are two primary reasons to enter a competition; constructive feedback and bragging rights. Most competitions, especially those that are BJCP qualified, will provide you standardized judging feedback in one of two forms. The long form is preferred for the amount of detail and feedback that allows a judge to better communicate their experience with your beer. The short form is more of a check list with very limited space for direct feedback. Both should provide honest and direct sensory descriptions with some possible recommendations. Judges are looking for off-aromas, off-flavors and analyzing the malt structure, hop character, yeast and fermentation characteristics, as well as balance. Good examples can be found in the home-brew reviews here on the BrewUnited forum. To provide continuity, beers are judged against documented BJCP beer guidelines (2008 and 2015), and it is the brewer's responsibility to enter the beer category that best fits the brew. Typically, tables are set with two or more judges, pairing the less experienced with experienced (and preferably BJCP Certified) judges. A flight (8-12 bottles) of a single category of beers will be set in a cooler with labels identifying the entry with a unique number. No other identifying marks should be on the bottles, including the crowns. The head judge will review the list and any available descriptions (some styles require key ingredients to be declared) and choose an order to sample. In wide specialty categories, judges can move heavily spiced/smoked or intensely flavored beers to the end of the flight to prevent palette fatigue. Each beer is then judged, with a score sheet filled out and a consensus score determined after discussion. The consensus is determined by comparing score sheets, and attempting to resolve scores to within 7-9 points. Usually, the consensus score is an average, but doesn't have to be. Once the flight has been judged, the beers are ranked and indicate the top 3 high scores. If a category contains multiple flights, then a mini-Best of Show (mini-BOS) round is scheduled. Each flight then pushes the top 1-3 beers into the mini-BOS. Here the best beers are ranked (without a new sheet) and places 1 to 3 are determined, and sometimes an Honorable Mention is declared. In some competitions, a true Best of Show is judged, taking only the top placing beers in each category. To win BoS, your beer must be truly outstanding and in prime shape! Let's be completely realistic. Judging is subjective. Scores may vary widely depending on the competition, judges, and luck plays a huge role. This is a preferential system - so if the judges prefer an insanely hopped DIPA, that will likely score better than an English Mild in a Best of Show round. A good competition will judge each entry on its merits against the guidelines. This should really help set your expectations - medals are really cool, but be prepared to be disappointed if you expect a medal from every entry. Most competitors with large racks of medals enter a lot of beer into every possible competition and still place only about 10% of the time - and these guys have their recipes, techniques, and strategies dialed in nearly perfectly. Consider and control what you can control. Minimize the rest. You should expect the competition coordinator to contact you if something occurred with your bottles in shipping or processing. There maybe time to resubmit your beers. You should be notified if your entry is somehow disqualified, but many comps will still judge your beer regardless. You should expect reasonably good feedback on your score sheets, and they should get those to you in a timely manner. Usually it takes about 4-6 weeks to process all of the paperwork and get the sheets back to you. If you are unhappy with the feedback, you should feel free to write the competition coordinator about the issue. You can also contact the judges via email, but I would limit that to good scores and getting more detailed feedback. Not all beers are memorable - so sending a copy of the beer sheet maybe needed. Be reasonable and understanding. These competitions are usually run entirely by volunteers, including judging. It can be very difficult to run a smooth competition or find an exceptional group of judges. The coordinator does everything possible to make the event fun and informative for all involved. If you are simply entering to brag about your medals, be prepared to be disappointed. Please consider your goals and plan accordingly. Take the feedback seriously even when a beer places. There is no room for complacency, poor losers or egomaniacs in home brew competitions. Setting a competition budget and planning out key competitions on a calendar is key. If you are on a budget, focus on local competitions where you can avoid the costs of shipping. Look for free competitions (many Pro Ams) and look to your clubs for opportunities to save on transportation. My local club has a dedicated driver to drive entries just about anywhere in state. We all chip in on the gas with a little bonus to cover that person's expenses. Be aware that he/she may have to comply with state regulations on transporting home-brew, so be prepared to fill out extra paperwork. A little math: If you enter only 4 competitions per year with 2 entries at an average of $8 per entry, you are spending $64 just on entry fees. Shipping can average $35 per box of two entries, adding another $140 in shipping alone. That totals $240 a year! Work back from the calendar to brew and ensure your beer is in peak condition for judging. Consider having beers to age into competitions, but don't enter a year old IPA. Look at the seasons and locations, avoiding shipping beers across the entire US during the very hot summers. Of course, the more competitions you enter, the higher the chance that your beer will score a medal. Being selective of the competitions you enter, planning ahead appropriately and fully accounting costs can help you balance your budgets and maximize your chance at some bragging rights. Most competitions use the same portal software, so you will most likely recognize the interfaces. Have a plan when entering to avoid trying to change entry categories. Make sure to have a credit card or PayPal account handy to pay for your entries and memorabilia. If you are nearby, you can also sign up to judge or steward. I would encourage you to do this at every opportunity. The experience is informative. Usually, you will create a new record for each entry, and required to choose the category and subcategory and a beer name. Once you have paid, you can return to these and print your labels. Some competitions will ask for a recipe sheet to accompany the entry. Make sure to read the directions carefully. You may also need to send along print outs of your registration and payment confirmation. Double check the shipping addresses and any other specific directions. Keep the costs of shipping in mind as you enter. 2-3 day shipping can be expensive on top of the $6 - $12 per entry fees. Those fees offset the costs of the competition and help fund club activities or sometimes are donated to a local charity. Of course, this is up to you. Some competitors brew into styles that are less known and likely to have fewer entries. Others go headlong into common and popular styles like pale ales and IPAs, hoping to stand out. Brew what you like, but brew with excellence to style guidelines. Also remember that you may need to brew to the extreme edges of a style to stand out from the noise. That doesn't mean you shouldn't enter your Chocolate Raspberry Chipotle Saison. Just make sure it goes into the right category. The best advice is to enter your very best beers. Many clubs organize competition schedules - getting involved gives you access to great competitors and cooperative strategies. Don't try to game the system, but maximize your advantages. You should be submitting your best possible beers, not marginal ones with significant flaws. Taste and judge your own beers before you enter them! Realistically, any well brewed beer can do well. Avoid off flavors and off aromas, package and ship carefully and set your expectations appropriately. Think through the shipping scenarios and prepare for the worst. How should I package and ship? Bottle as close to possible to your shipping date to send a pristine set of bottles. If you are bottle conditioning, then plan accordingly and allow at least 3-4 weeks of conditioning. Of course, bottle in the appropriate size and use unmarked crowns. I like to keep a box of brand new 12 ounce brown bottles handy for competition. Make sure to clean and sanitize the bottle, crowns and anything that comes in contact with your beer. This includes counter pressure or beer gun fillers. If bottling from keg, slightly over carbonate your beer. I like to set the pressure 1-2 PSI higher for a week before bottling. This compensates for CO2 losses during the process. Cool the bottles and equipment to the same temperature as the beer to reduce foaming, purging with CO2 before filling. Cap as quickly as possible, label as directed and store in the refrigerator until ready to box up. Bottle at least 1 or 2 extra bottles and mark them with the competition information. Set them aside in the fridge. Return to these when you get your judging sheets back and do your own evaluation. Ship at the appropriate time. I try to make sure that my beers arrive close to the cut off point. This helps to extend my control over the beer quality longer, reducing the time it might sit in a hot truck en route. While it can be expensive, it is a good idea to pay the premium for 2 or 3 day delivery and get a receipt of delivery. AND ship early in the week to avoid a weekend on a hot truck. Choose competitions that are local, and deliver with your club or in person. This is the best way to ensure that your beers are handled appropriately. Packaging for shipment or delivery should be handled in a similar manner. You want to ensure your bottles arrive safely and in the best possible condition. This, however, does not mean taking obscene steps to protect your bottles. Remember that volunteers need to easily extract your beers and sort them. Avoid packing peanuts, duct tape and other extreme materials. Look at the AHA NHC Rules (Section III) for more advice. Use an appropriate sized sturdy cardboard box and line it with a garbage bag. Use 4-pack and 6-pack holders. These help to contain your bottles in a safe manner and prevent them moving around too much. Most competitions require you to (A) rubber band a label to each entry and (B) remove any other identifying marks. Use new bottles and plain gold crowns when possible. I recommend putting the label into a baggy before using the rubber band, and wrapping the band just once. Wrap/roll each bottle in a single layer of thin bubble wrap using a small length of scotch tape to secure. This should still fit snugly into holder. Fold the bubble wrap over the crown and bottle bottom and tape down. Alternatively, puppy training pads work well and can contain a leak. For each holder, wrap again with thin bubble wrap. You may wish to put this into a separate plastic bag and seal. For long shipments or during hot summer months, I try to add 1 or 2 frozen gel packs (in a ziplock bag) for each holder. Place layers of crushed paper (newsprint works fine) on all sides inside of the trash bagged box. Set each holder inside and pack more paper to prevent movement. Make sure additional padding is added between multiple holders. Secure the trash bag by pushing out as much air as possible. Securely tape all edges of the box. Make indications of UP and FRAGILE on all sides of the box. If I am not shipping right away, I put the whole box into a fridge until just before I drop it off. Ship only through Fedex or UPS. You are not required to declare what is inside, unless insuring. I ship through an independent shipping facility so questions are kept to a minimum. Most 2 or 3-day shipments will automatically come with confirmation of receipt. As mentioned, competitions are not for everyone. The biggest challenge in my brew house is matching beers that I like to brew with competitive styles and knowing IF and WHEN they should be entered. Here, leveraging home brewing friends, clubs and BJCP judges can give you a leg up. Share your beer and ask for formal and serious feedback. Calibrate your palette to detect off flavors and flaws. Don't waste your money entering flawed beer. 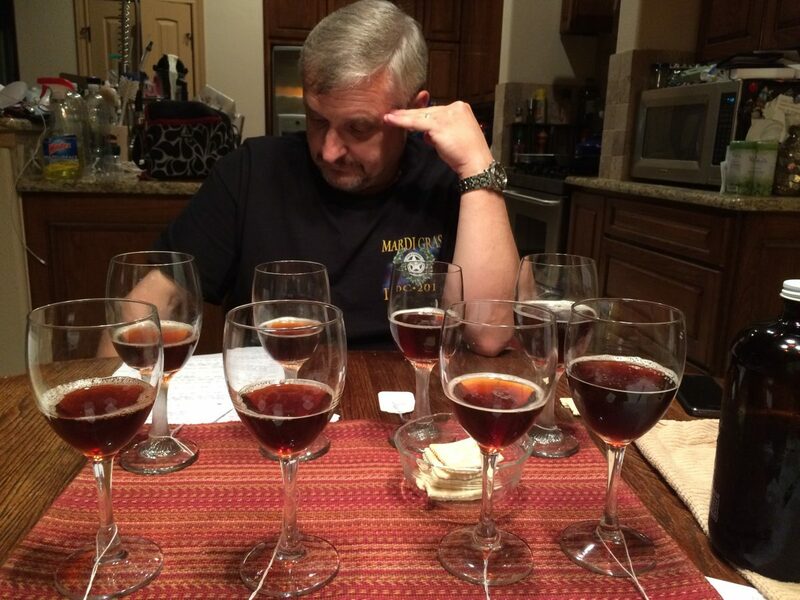 In my experience, judge evaluation outside of a competition will score your beer higher but provide much more detail. Pay attention to that and expect the score to be somewhat lower in competition. In turn, taste your beer with the judge and review the score sheet, and if needed, rebrew the recipe accounting for any of the flaws and recommendations made. Competitive brewing can be fun and rewarding. That said, bad winners are as awful as sore losers. Celebrate your wins and move on, and plan your path to a Ninkasi! Matt is the homebrewer and writer behind Accidentalis.com, which was started to support Brew-Magic users with tips and tricks, recipes and general brewing information. The site also hosts a good deal of water management information, along with tutorials on using M. Brungard's Bru'n Water Spreadsheet.